Love the style and color of the table. Modern and unique, exactly what I was looking for. Giving this 3 stars only because the table arrived with the base made backwards, which caused screwes on base legs to be exposed. Overstock sent me a replacement table which arrived the same way. I was able to figure out a way to make this work on my own by drilling new holes, but this table has 13 small screws which makes it not easy to take apart. Overstock also offered no discount for my troubles which is disappointing. Seems like a manufacturing defect but the vendor should still take responsibility. Style and color are perfect though - would give 5 stars for appearance only. This looks even better in person. Easy to assemble and very sturdy. I have this on my patio next to my patio furniture and am using it for an end table and also a footrest. Beautiful piece!!! I bought the set of Cape Coral and it's perfect the 2-piece end tables. What you see in the picture, is what you get! I like the style, it's​ very contemporary and perfect for my porch. Just received this unique table. We love the contemporary shape and coloration. The silver color is complimentary to all outdoor collections. Love it! Getting ready to order more. Love this furniture set. I bought this as an extra table for the set I purchased. The tables arrived on time and were nicely packaged so there was no damage during transit. We purchased these to go with the Christopher Knight club chairs and they look great. Very nice quality and together they look like an expensive ensemble. We are pleased with the purchase and would recommend. 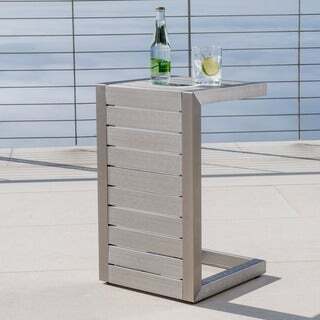 This is the perfect size table to use between patio club chairs or chaise loungers by the pool. It has a sleek and modern feel, and is very easy to clean. I love the fact that it's made from aluminum so it can stay out in the rain. Very easy to assemble. I liked it so much that I bought a second one! We ordered 5 of these end tables for our yard. We put 2 of them in between our 4 Cape Coral chaise lounge chairs and the other 3 are placed in between chairs we purchased for the patios outside our 3 bedrooms. We are very excited because they look awesome!